While we can only hope that this principle is properly implemented in the criminal court system, the degree to which it is absent in another key court — the court of public opinion — is shocking. In much of the mainstream media — as well as in the minds of many members of the public — being arrested is sufficient reason for the suspect to be deemed a criminal. When the accused is an elected official, presumption of innocence is virtually non-existent. A classic case was when Raymond Donovan, then-secretary of labor under President Ronald Reagan, was forced to resign in 1985 after being indicted on charges that included seeking to defraud the New York City Transit Authority of $7.4 million. Two years later, he and his co-defendants were acquitted on all charges. But no one offered Mr. Donovan his job back. Republican Senator Joe Bruno was the New York State Senate’s majority leader for 14 years before stepping down in 2008. He was first tried for fraud in 2009, and acquitted of five charges and convicted of two, which were, in turn, overturned on appeal. Prosecutors refiled those two charges, leading to another trial. A year ago, after a legal battle that took more than five years, it took a jury only four hours to acquit the former leader of the New York State Senate of federal fraud charges. Now comes word that yet another Republican Senate majority leader is facing legal troubles. During his more than three decades in the State Senate, Dean Skelos has earned the respect of his colleagues and the admiration of residents across the state. It is inexcusable that word of a federal investigation involving Senator Skelos was leaked to the press weeks ago, and a report of an impending arrest was made public days before it was scheduled to occur. While it was once common practice for journalists not to release names of suspects before charges were filed, it is highly unfortunate that this is no longer the case. But it isn’t only the media that is to blame; it is deeply troubling that the office of the federal prosecutor investigating the case has allowed the leaking of such information — clearly intended to humiliate the senator — to take place. It is noteworthy that only weeks ago, a judge took this same prosecutor to task for public comments he made regarding the case of another high-ranking elected official who has been indicted. Mr. Skelos, like other elected officials facing legal troubles, deserves the same rights afforded every American. Not only must he be considered innocent unless proven guilty, but as the case makes its slow journey through the legal system, he also deserves that every effort be made to ensure that his reputation remains intact unless he is found guilty. As Mr. Donovan found out the hard way, there is no office where those found innocent can go to get their reputation back. This article appeared in print in the May 6th, 2015 edition of Hamodia. 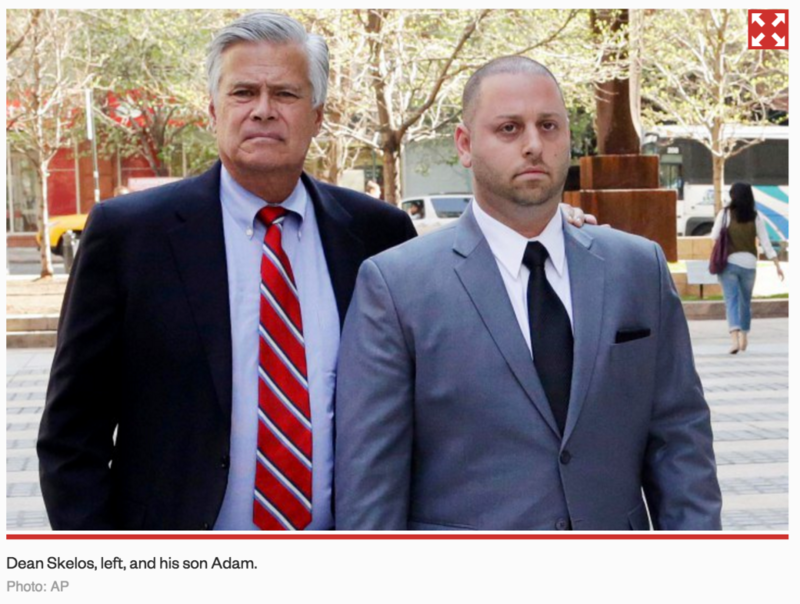 Ex-state Senate Majority Leader Dean Skelos and his son Adam filed papers Friday seeking dismissal of two of their eight federal corruption charges. Charges related to Skelos using his power to get an environmental technology firm to pay Adam $200,000 should be tossed because they’re based on Adam’s “admittedly false or seriously exaggerated statements’ to the company about what his father was doing on its behalf,” the Manhattan federal court papers state. Evidence from wiretaps of Adam’s cell phone should be suppressed because the taps were “a fishing expedition,” the court papers add. 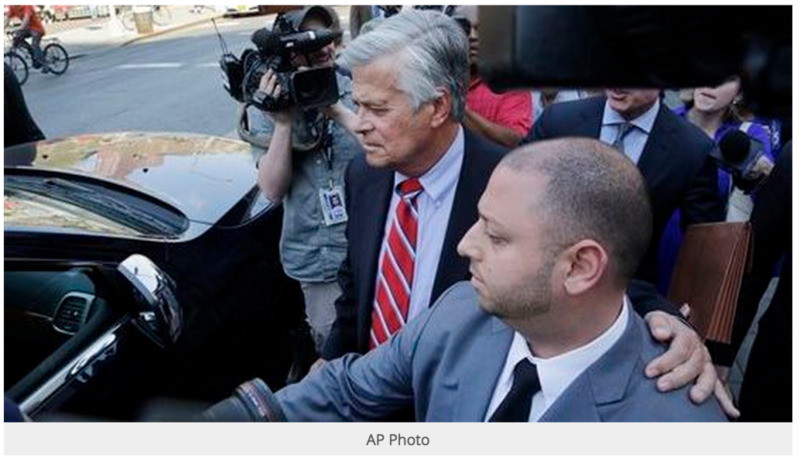 Skelos also accused prosecutors of leaking secret grand jury information to reporters. A Manhattan US Attorney spokesman declined comment. As much as $3 million to $4 million: That’s how much it may cost the Skelos family to defend themselves from corruption charges brought by the U.S. attorney. That estimate is based on the millions former Senate Majority Leader Joseph Bruno had to spend to clear his name after he was brought up on corruption charges and subsequently acquitted. After his indictment, Bruno was forced to empty his personal bank account and then tap all of his campaign funds, but he still came up short by millions of dollars. In standing firm and refusing to plea bargain, he put himself in hock for the rest of his life. Upon acquittal Bruno forcefully reminded the State of New York of its obligation under law to pay his legal expenses and, after much beard tugging, the attorney general’s office was compelled to agree. They only signed off on $2.42 million. The state comptroller then knocked it down by $1.8 million. The math is obvious. Bruno won acquittal and lost everything else. Dean Skelos and his son, Adam, are facing a similar road, which is why his allies are launching the Skelos Family Legal Defense Fund. That entity will become a vital link in the legal defense required to confront and defeat the allegations in a court of law. The fund will need to be broad-based and grassroots. It will need to accept donations from anyone who believes in the personal integrity of the Skeloses and the inherent unfairness of a system that allows the prosecution to literally spend tens of millions of dollars to put their case together for the purpose of running the defense team into a financial ditch. The unfairness of the situation goes beyond just the financial imbalance. The prosecution gets to widely publicize the unproven accusations at the outset. The defendants on the other hand can make no specific responses to them, which unfortunately makes them seem guilty even if they are merely invoking their fundamental Fifth Amendment right to remain silent so as not to prejudice their case while they are mounting their defense. The most troubling aspect of all of these prosecutions is how and who decides which particular elected officials to prosecute and when to do so. The prosecutorial discretion power is so strong that it has actually become much more effective in forcing leadership change than a general election where political opponents seek to unseat them at the ballot box. We have seen past U.S. attorneys from New York go on to run for mayor, governor, district attorney and even president of the United States. The position has become one of the most powerful non-elected positions in our government, which can have more of an impact on policy than the actual officials elected by the people to represent them. The need for a truly independent bipartisan prosecutor in these political cases appears obvious and one may wish to consider restructuring the tenure of U.S. attorneys the way we do for federal judges so the role is not viewed as a stepping stone to another political office. Ryan is the executive director of the Association for a Better Long Island. This fund was set up by friends of the Skelos Family to help cover the exorbitant legal costs that are being incurred in defending the Skelos Family against politically motivated attacks being brought by the United States Attorney.